On the 8th of November, reports emerged on Twitter that DC police from the 7D station shined lights into an activist home in Anacostia, and screamed at the women inside. Two cops showed up and shined lights into the house, then started screaming threats when asked why they were doing this. Cops also pulled over someone leaving the BlackJoySunday event that was being held at the house that evening. On the 10th of November, Israel's extremist Prime Minister Netanyahu spoke at the Center for American Progress. His motorcade had to pass jeering protesters on the far side of the street. Not only that, as his motorcade was being planned the protesters were on the near side of the street. Had the protesters refused to move the motorcade-and the speech-would have had to wait. Until protesters actually did move the outcome of this was unknown to police.No head of state likes to run a gauntlet of jeering protesters. 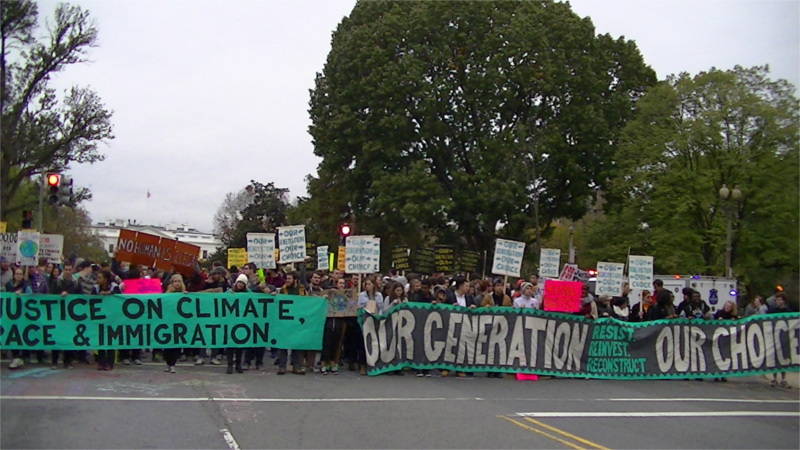 On the 9th of November, hundreds of marchers took to the streets for the "Our Generation Our Choice" march against climate chaos, racism, and militarized policing. 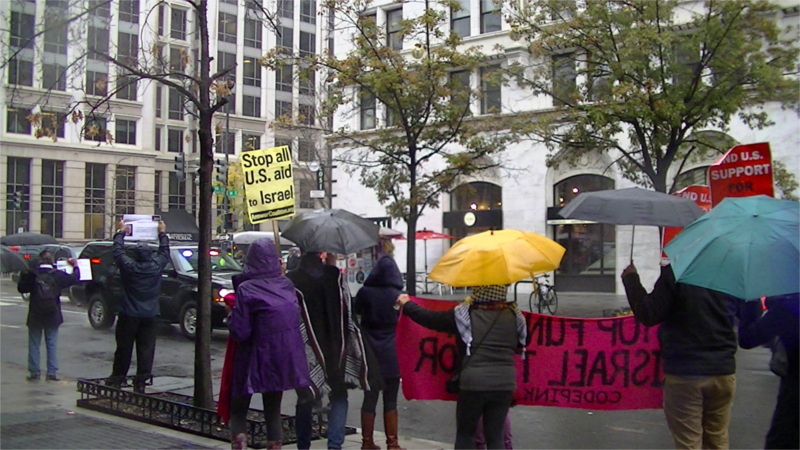 Simultaniously, a rally was taking place in front of the White House protesting Benjamin Netanyahu's, visit begging Obama for more military aid. When the climate march arrived at 16th and H, they stopped and blockaded the intersection. Police tried and failed to prevent the two protests from joining forces. 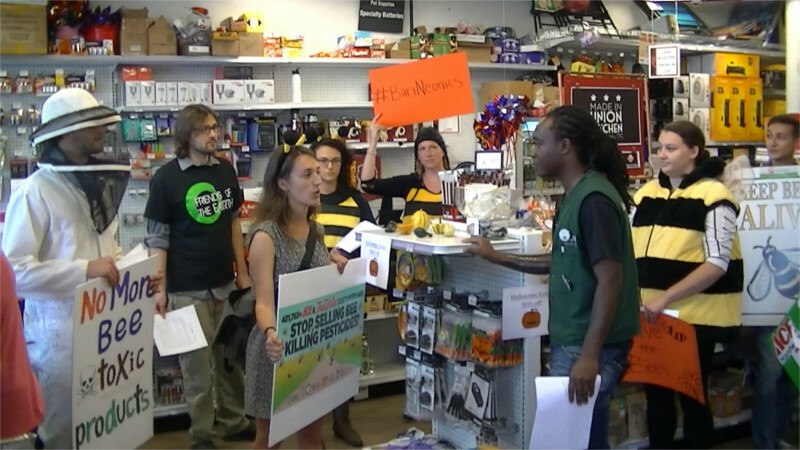 The intersection of 16th and H completely blocked by "Our Generation Our Choice"
On the 28th of October, Reuters reported that a Monsanto "research" facility in France was heavily damaged by a fire police believe was almost certainly set. The blaze began in two places at once, smelled of gasoline. The lab specialized in corn researh, almost certainly concerning genetically-modified crops. Although no communique claiming credit has emerged from any group, this sounds like Monsanto has run into a new version of the French Resistance. On the 6th of November, President Obama formally rejected TransCanada's permit for the Keystone XL tar sands pipeline to cross the US-Canada border. After 7 years of struggle, the resistance is catching fire, and pipeline after pipeline is being rejected. With other pipelines in Canada also being stopped and oil prices plunging, tar sands projects are being cancelled and investment funds for "unconventional oil" are drying up. Protest WORKS, and on the evening of Nov 6 activists gathered in front of the White House to celebrate victory in what has been a long and difficult battle. 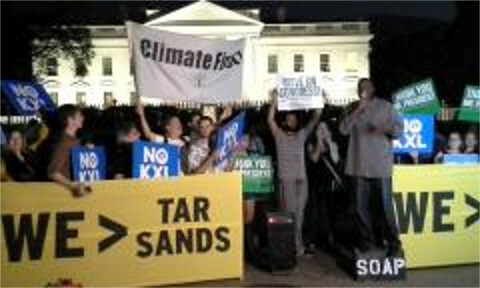 The victory celebration on front of the White House on the evening after the Keystone XL permit was formally rejected. 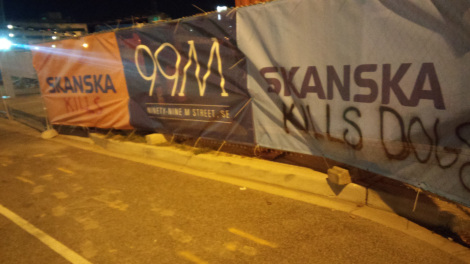 Sometime over the Halloween weekend (also known as Earth Night), animal rights activsts redecorated banners on the fence of a Skanska construction site in DC. They added a reminder that Skanska is also building an underground animal testing/torture lab for the University of Wisconsin. 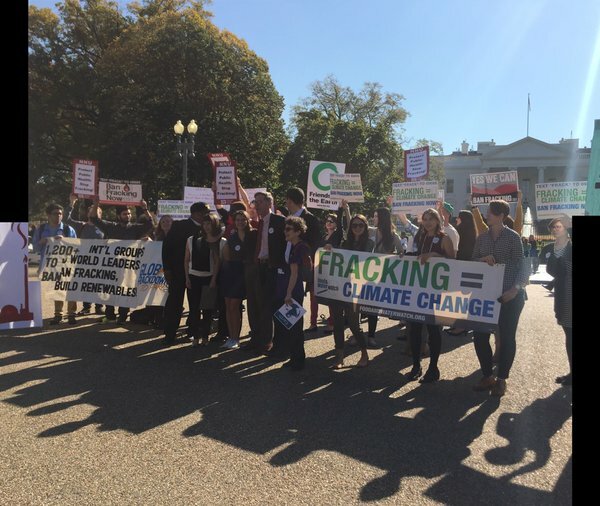 On the 3ed of November, Americans Against Fracking, National Nurses United, and other groups gathered at the White House to deliver the Global Frackdown letter demanding a ban on this destructive practice. Obama will be heading within a month to the Paris Climate Summit, and fracking is a major part of the US contribution to climate chaos due to the methane leakage it causes. Bank of America is one of the major investors in Dominion's LNG export project in Cove Point, MD. 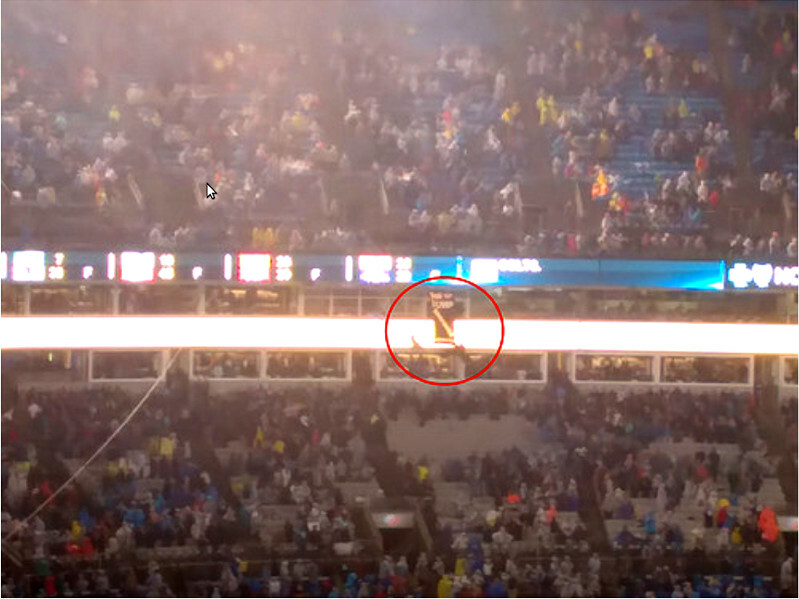 On Monday, the 2nd of November, members of We Are Cove Point suspended themselves and a banner from the top deck of the stadium as Charlotte Panthers played Monday Night Football against the Indianapolis Colts. The banner read "“BoA: Dump Dominion, WeAreCovePoint.org" and was visible to an audience estimated at 70,000 people. On Halloween night, protests at the neo-Nazi National Policy Institute convention continued until the Nazis had to leave. 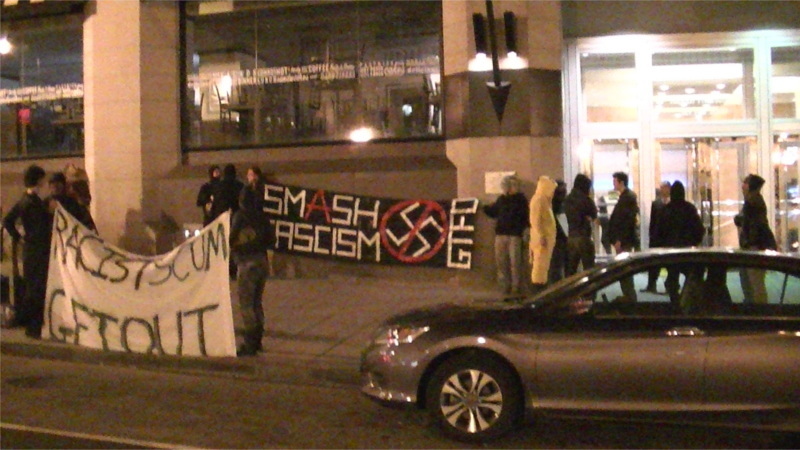 At arount 10PM, all of the Nazis tried to flank the protesters by going around to the F st doors while protesters were on 14th st. Protesters saw this developing and charged over, getting there first. The resulting situation drew bike cops. Meanwhile, a few activists were still on 14th st. A white supremacist named Sam Dixon, former lawyer for the KKK, asked the police to arrest Sima for wearing a mask-and they complied.